Over two thousand years ago, on a hill outside of Jerusalem, a man was crucified for claiming to be the Son of God. 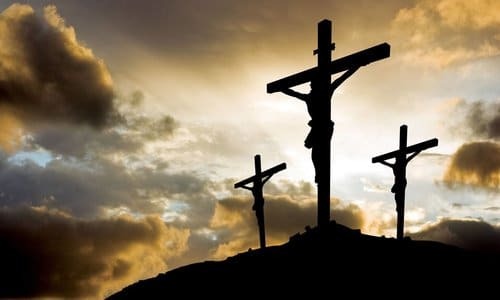 Since that day, believers have pointed to the Crucifixion of Jesus as the central event in history, while skeptics touted there was no proof that it even happened. A recent geophysical investigation looks into the evidence of the earthquake that took place at the moment of Jesus' death as mentioned in Matthew 27; an earthquake that was powerful enough to rip the Veil of the Temple in half. From Mite Productions and Rick Larson--the creator of universally acclaimed "The Star of Bethlehem"--comes "The Christ Quake" in which scripture, history, and science converge at the epicenter of the event that shook the world to its core. Rick Larson is a lawyer and law professor. Intrigued by the question of what the Star of Bethlehem was, he poured years into searching scripture, history, and modern scientific research to determine that the star had been an actual astronomical event. The result was the critically acclaimed presentation, "The Star of Bethlehem." Larson's research has been vetted by scientists. The Former Chief of Planetary Astronomy, NASA, and Technical Editor, Sky and Telescope Magazine, calls it, "Well researched and reasonable." The President, American Association for the Advancement of Science said it was, "Wide-ranging and insightful scholarship." This was the subject of his critically acclaimed documentary, "The Star of Bethlehem." For the last five years, Larson has been working on a new project. "The Christ Quake" which explores the science, history and Scripture surrounding the earthquake on the day of Jesus' crucifixion. In this presentation, Larson brings the same passion, the same meticulous attention to detail that he did in "The Star of Bethlehem." When asked about his two projects, Larson said, "Arguably, there are two greatest events in Christianity. The first must be the Incarnation, when God came to live with us as Jesus. We celebrate this event as Christmas, and God chose to announce it in the stars. He also chose to leave enough clues in scripture for us to demonstrate today that Christ's Star was real. The fact that it is God's chosen way to announce the Advent may be why "The Star of Bethlehem" DVD continues to bring joy year after year. We are reliving God's announcement! "The second greatest event in Christianity must be the Cross. We celebrate Jesus' death and resurrection at Easter. But it was on the Cross where the terrible work was done. It is on the Cross that Jesus announced the good news: "Tetelestai!" "It is finished! Paid in full!" He told us from within His agony that His mission to earth was a success. God agreed, He chose to mark this success by shaking the very earth. He also chose to leave clues sufficient for us to demonstrate today that this earthquake happened. It is our goal in making "The Christ Quake" to share with the world that this second greatest event left evidence as did the first. Again, we can relive God the Father's announcement! It is with humility and joy that we bring objective, historical, scientific evidence of these two greatest events to the screen. Evidence that ties Jesus, both His arrival and his success, to space and time and history." The Christ Quake DVD is now available from Prophecy News Watch by clicking here.